Whether you believe she bankrupted France’s treasury or she was just a victim of tragic circumstance, you can’t deny that one of Europe’s most famous historical monarchs, Marie Antoinette, had bags of style. Yes, so she’s mostly known for losing her head, at the hands of the guillotine, in 1793 after falling out of favour with, shall we say, pretty much the entire French population. But who cares? This queen is as much remembered for her lavish tastes and chic fashion sense as her untimely demise. So when a new restaurant opens up that seems to almost channel the spirit of the famous femme, both in its space and its Gallic culinary offerings that are fused with Asian innovations, you know you could be in for something a little special. 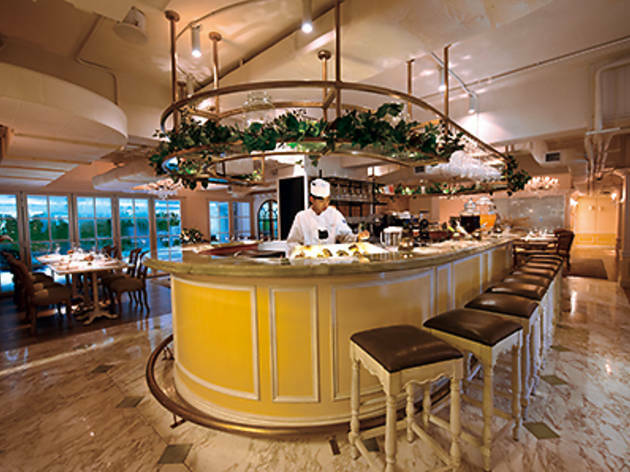 The kitchens at Maison Es are helmed by the illustrious Esther Sham, a model-turned-chef who’s the brains behind private kitchen Ta Pantry, which was launched in 2008, and used to sit in Star Street before moving to North Point in 2013. Sham is anything but a wallflower, establishing herself as a culinary maestro over the years. However, at Ta Pantry, it’s a pricy affair, as there needs to be up to 10 of you, so total costs can soar over $9,000. 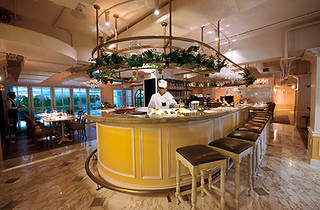 Maison Es is Sham’s accessible option for those who want to sample the chef’s culinary prowess without having to bring an army of hungry friends. So, that’s what we set out to do. The menu is separated into starters, mains and desserts, with six to eight items in each category. We select the coddled egg on black truffle mash ($120) and the crispy foie gras and fig wontons ($190) to begin our meal. Served in a mason jar, the egg fares well with the potato and the truffle but the combination hardly surprises. The wontons, though, are arcs de triomphe. Adhering to the garden motif, the appetiser arrives on a flower-patterned plate, with a slice of fig perched on top of each of the three deep-fried foie gras wontons. The flavours are as delicate as the presentation and the accompaniment of mushrooms and lily bulbs freshens the palate, while the ingredients pay homage to chef Sham’s Chinese roots. This theme continues on to the mains, where we choose the maple-roasted black pork belly ($260) and the duck breast, seasoned with yuzu ($260). In the former, the sweet maple enhances the evenly distributed pork fat while the sautéed lardo adds an extra crispy sweet kick to the dish, as Sham’s jus remains balanced alongside some slightly acerbic brussel sprouts. The rich aromas work stunningly well together but our taste buds are dulled a little too quickly by the heavy flavours. Luckily, though, this is not a problem with duck breast. Over an inch thick, the texture of the rich meat is tender and succulent. The hint of the Asian yuzu citrus fruit cuts the fatty bite of the skin as the shreds of daikon, cooked in mirin wine on the side, provide a break from the flesh. Definitely the star of the evening. For something sweet, we plump for the Valrhona chocolate and mint fondant ($160) and a brûléed brie ($140). The molten cake is gorgeous, with its lush chocolate filling oozing out of the thin cake. Instead of using mint extract, Sham uses fresh mint leaves mixed in an egg and flour mix, which melts at the same consistency as the chocolate. The brie is also heavenly. The slice of cheese is burnt on all sides with sugar and comes with graham crackers that elevate the cheese to a dessert status. The flavours mix wonderfully and our meal ends on a delightful note.